All-IN-ONE All in ONE trip! 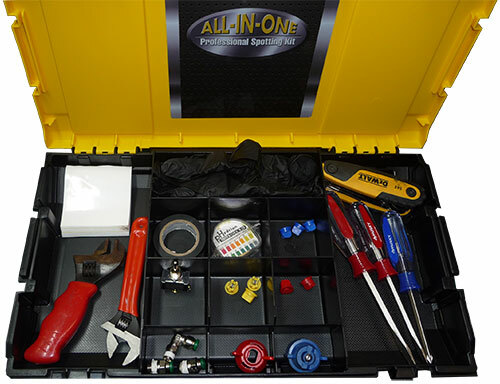 The All-In-One Professional Spotting Kit is the most versatile kit in the market. 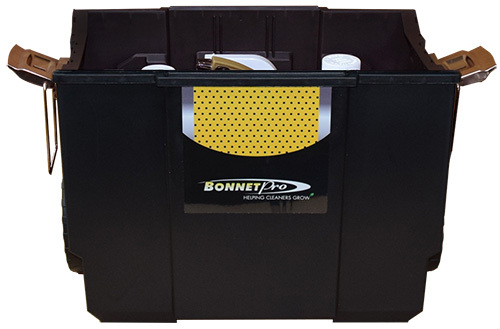 While other companies place their spotters in a cheap lunch bag type container, Bonnet Pro uses lockable (spotter section only) rolling three container workshops that separate into smaller satellite boxes when needed. 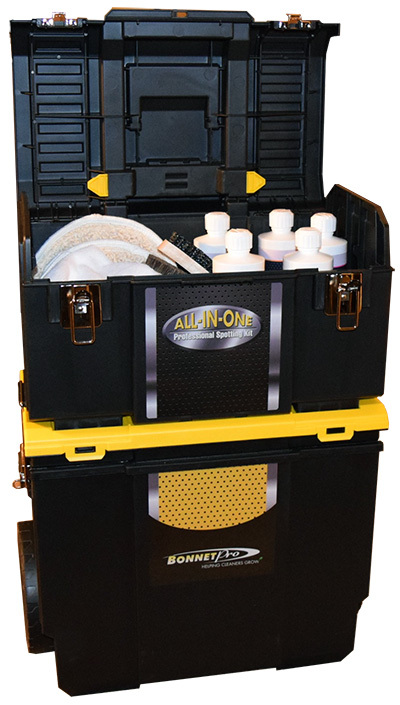 Get the only spotting kit available that let you take everything you need onto your job site in one easy trip. No more wasted time back and forth to the van. 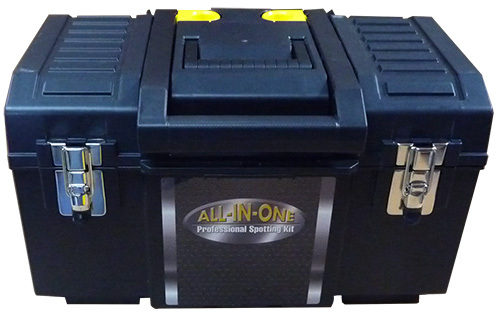 With the All-In-One Professional Spotting Kit you not only make just one trip, you look professional doing it. 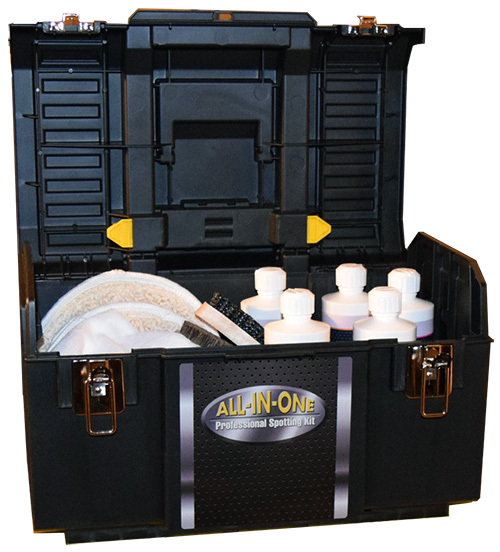 The top kit contains Bonnet Pro’s specialty spotting kit, holding a pint each of Bye Bye Red Dye, Gum Grease & Ink Remover, Rust Stain Lifter, P.O.G., and Waste-Away Urine, Stain & Odor Remover under our OMEGA brand, so you know these products work great! 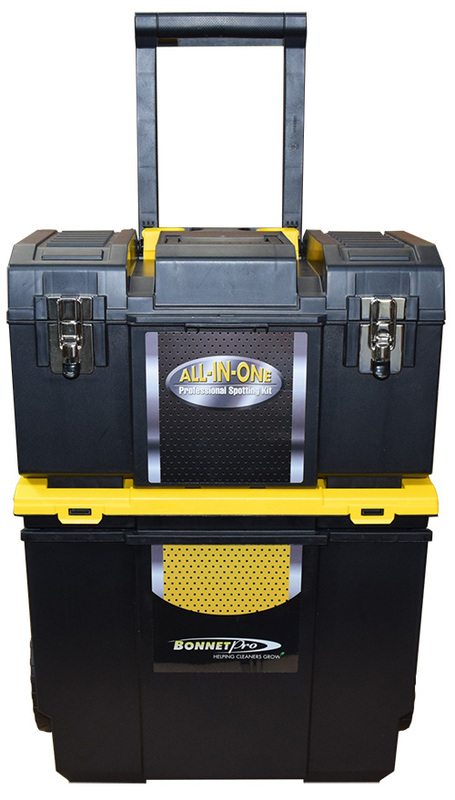 The kit also contains 2 spotting brushes. 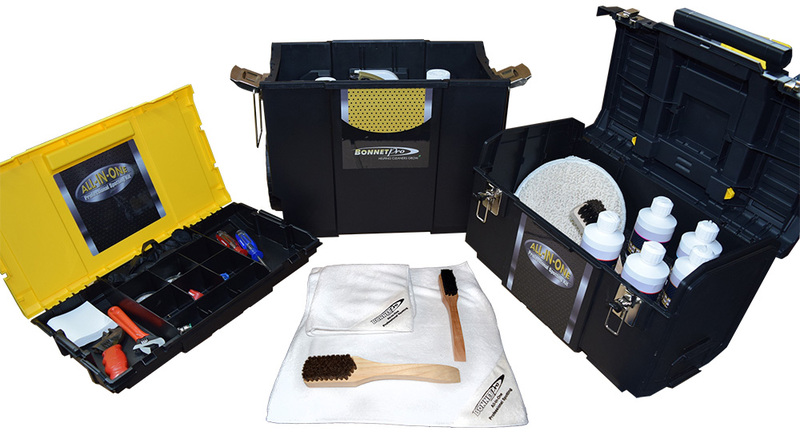 A horse hair brush, safe for most carpet or upholstery materials, and a stiffer nylon brush for synthetic carpets, 2 – 8” spotting mitts and 2 white micro Fiber spotting towels in a custom foam holding tray. The center section is great for extra spray tips, tools, pH paper, gloves and all the little stuff you need right at your finger tips. Contents contained not included. 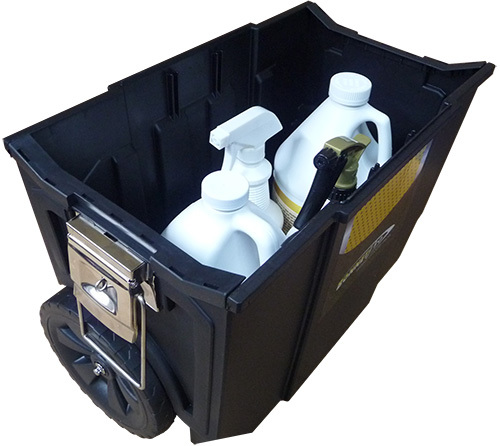 The large bottom section holds 2 gallon jugs plus two full sizes quart spotters so you can carry all of your cleaning chemicals into the building for larger jobs, or fill it with your iron and extension cord for red stain removal, and/or bonnets . Either way you have plenty of extra space to use it as you need. Contents contained not included. Now you can take everything in just one trip! A must have for every professional.